Before I started blogger, I used to make handmade greeting cards and sell them at flea markets and on eBay. I actually taught classes on how to do it. I was totally OBSESSED with the process and had an entire room in my old house dedicated to storing my collection. Then I had children and sold everything online at a discounted price just to get it out of my house. I SO WISH I DIDN’T do that now! Look at the brilliant idea! Sugar cookie dough embellished with stamps! It could be anything – words, pictures, symbols. You name it – the options are limitless. 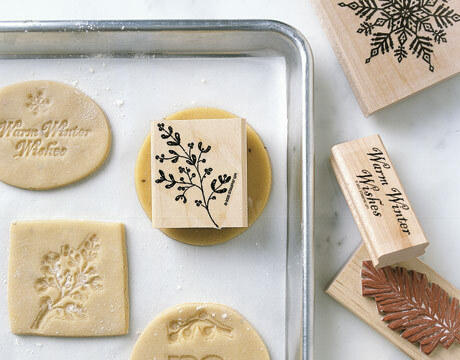 If you have an occasion coming up and you want to get a little creative with dessert, consider hitting up Michael’s and picking up a stamp that makes sense. Perhaps someone is graduating or just starting school. Did a new baby arrive into the family? Is someone getting married? Anything and everything goes with this one! Thanks to Country Living for original idea.